If you’re not using a serum as a part of your daily skin care routine, you might want to consider adding one…or two. There is a lot of hype around serums lately—and for good reason. The right serum can do wonders to brighten, tighten, and transform your skin. However, all serums are not created equal. There are endless serum products available and many contain unnatural ingredients and fillers which are no good for the skin. If you’re going to add a serum to your routine, it’s best to use an all-natural version. In this guide, we’ll show you how to use serums and how to find the right serum for your skin. Serums are skin treatments made from highly concentrated and potent ingredients designed to tackle specific skin issues such as acne, wrinkles, dark spots, rosacea, blackheads, and hyperpigmentation. Serums penetrate deep beneath the surface of the skin to treat underlying skin issues. These skin conditions often require special treatment which a standard cleanser & moisturizer duo aren't designed to treat as effectively. What is a Natural Face Serum? A natural face serum will be made from natural, non-toxic, and preferably organic ingredients. They should be free from potentially toxic chemicals, unnatural fillers, and synthetic fragrances. Essentially, a natural serum should contain ingredients that you can identify and understand—with a few exceptions. In some cases, synthetic lab-created ingredients are actually safer than their natural counterparts. For example, synthetic vitamin c is more stable than natural ascorbic acid. These synthetic counterparts can be easily absorbed and won’t cause toxicity or damage to the skin. Why Choose a Natural Facial Serum? It’s important to choose a natural and organic facial serum for the health of your skin. Facial serums are made from ingredients which are small enough to penetrate the top layers of the skin. If you are using a serum made from synthetic ingredients or potentially harmful chemicals, then these chemicals will also penetrate the skin. Certain unnatural ingredients (such as propylene glycol, phthalates, parabens, and phenoxyethanol) can cause skin irritation and have been linked to hormonal disruptions, contact dermatitis, and even cancer. How to Use a Facial Serum? Serums are designed to be used after cleansing and toning, but before applying a traditional moisturizer. Some serums can be layered on top of one another for maximum effect. You can also choose to alternate serums by wearing one serum during the day and another serum at night. Can You Use Serums on Your Body? Yes! You can use facial serums to treat skin conditions on the body. For example, you can treat stretch marks by spot treating with a collagen-boosting facial serum. Word of advice: if you’re going to use a serum on the body, then use it as a spot treatment because serums can be expensive. How to Choose Serums for Your Skin Type? Serums for Hyperpigmentation/Dark Spots: The best natural serums for dark spots and hyperpigmentation are those which contain ingredients which can brighten the skin. These ingredients include vitamin C, fruit acids & enzymes, citrus oils, kojic acid, niacinamide (vitamin B3), and licorice extract. Serums for Mature/Aging Skin: Aging and mature skin types need serums that boost moisture, stimulate collagen production, and reverse sun damage. The best natural serum ingredients to tackle these problems are pure vitamin C, hyaluronic acid, retinol, caffeine, coenzyme Q-10, antioxidants, and natural skin care oils with omega fatty acids. Serums for Acne-Prone Skin: Acne-prone skin types should choose a serum that can fight acne-causing bacteria, reduce redness, and balance oil production. 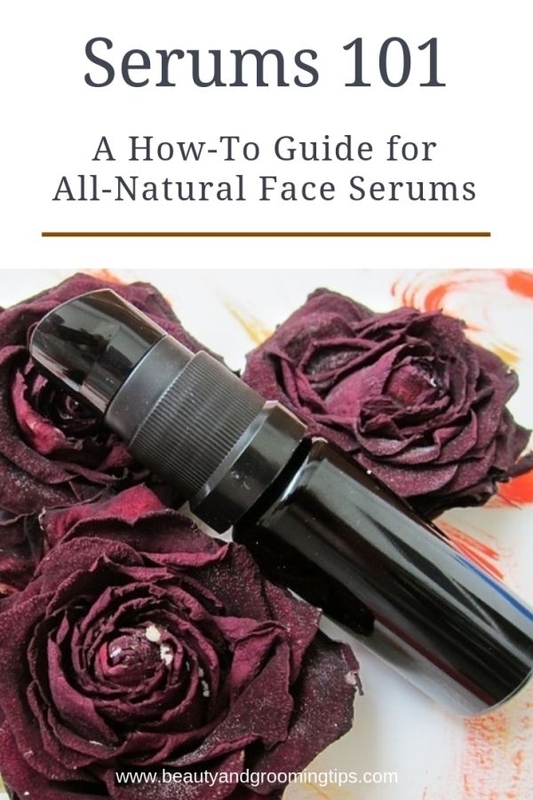 Look for an all-natural serum which contains ingredients like salicylic acid (also called willow bark), rose oil, tea tree oil, aloe vera, neem, jojoba oil, grapeseed oil, green tea, black cumin seed oil, alpha hydroxy acids, and rosemary. Serums for Sensitive Skin: Sensitive skin can include anything from rosacea to eczema, so the best serum will depend on your skin’s particular sensitivity. However, there are ingredients that work well to soothe all kinds of sensitive skin. Natural ingredients like calendula extract, cucumber oil, chamomile, aloe vera, marshmallow extract, sunflower oil, jojoba oil, green tea, and borage seed oil can work wonders to reduce redness and add hydration without irritating sensitive skin.